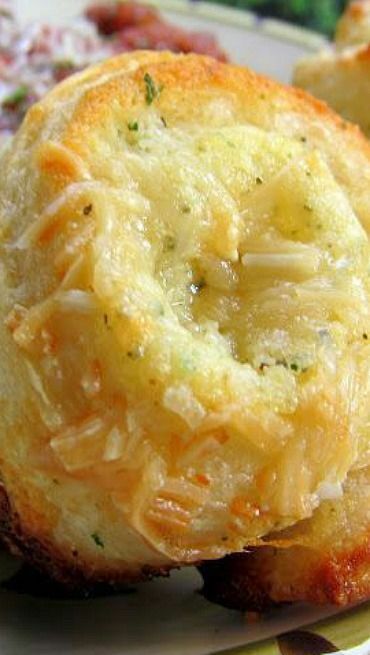 Garlic Roll Cupcakes - refrigerated bread sticks, garlic seasoning and butter baked in a muffin tin - SO easy to make. I could eat the whole pan myself!! We served these garlic roll "cupcakes" with the pasta I posted yesterday. They were dangerously delicious! I could have eaten the whole pan of these puppies all by myself. Luckily, I had some self-control. I used Johnny's Garlic Seasoning that I picked up at Costco last week. If you don't have Johnny's Garlic Seasoning, just use another brand of garlic bread seasoning. These rolls are super easy and super tasty! Lightly spray a 12-cup muffin pan with cooking spray. Combine softened butter, garlic bread seasoning and 1 Tbsp grated parmesan. Unroll breadsticks and separate into individual bread sticks. Spread garlic butter over each bread stick. Roll up and place into muffin pan. Sprinkle each bread stick wtih some shredded or grated parmesan. No need for pasta, just these and the sauce on my plate, please! Yum,yum! I am getting hungry, only by viewing them! Lets try it! Looks Yummy! Adding to my To-Do List! Made these along with several other recipes for 'junk food night' - AMAZING! I used an Italian seasoning blend bc it's what I had on hand- primarily used for spaghetti sauce... This will be a weekly addition to the menu!!! Thank you!!!! Oh my gosh, I bet these are amazing. We'll have to have these next time we do pasta night. I'm making one of your pasta dishes..
and these rolls for our home fellowship group on Sunday. You have come to my rescue so many times...and you are my go-to when i need a great but easy recipe. Just made this to go with beef stew. I used refrigerator biscuits rolled into coils. I also mixed my own garlic seasoning blend. I made 24 of these ... my hubby ate most of them!! I am like your husband - I could eat the whole batch myself! So glad y'all liked them!! My goodness. They do look totally yummy! These look amazing, will have to make soon. What is garlic bread seasoning? These look yummy! I haven't been able to find garlic bread seasoning in the spice section? Is it located somewhere else in the grocery store? This looks wonderful looks easy I will try this as soon as I can get to the market.